A huge thank you to Renee and Gregg Carstens of Atmosphere’s Indy for designing our summer 2016 showroom! 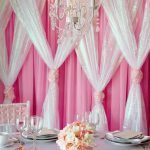 We love all the specialty draping and colorful details they incorporated in their table designs. 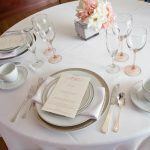 The first table you see when you walk in is a romantic sweetheart table featuring our white satin linen, white chiavari chairs, silver band china, prim flatware, and pink stem glassware. 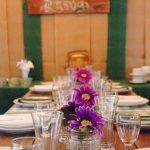 The second table has a family reunion theme featuring our natural wood stained chairs, castle white china, hunter & white check linen, flared pilsner glasses, and a farm table that Gregg built out of reclaimed barn wood. 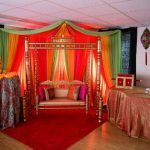 The final table is a colorful Sangeet ceremony featuring our orange iridescent crush and aladdin linens. Learn more about Atmosphere’s Indy in our interview below! Where did you find inspiration for your showroom tablescapes? Can you tell us a little more about what a Sangeet ceremony entails? Inspiration comes in many forms. Partly from client partly from experience and partly from a willingness to concentrate on the detail of each piece that makes up the whole. 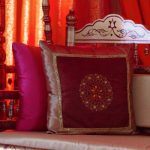 Sangeet means singing and it is traditionally a time for all the ladies in the bride’s family and friends to get together, to sing and to celebrate the good fortune of the wedding. But today this very colorful party – all family and friends are invited. Atmospheres Indy specializes in custom draping, lighting and structures. What has been your favorite project to date? In the last 4 years, we have helped in over 1,000 celebrations, to pick one would be impossible. The people are what we enjoy the most. And being a part of possibly the most important day of their life, well what an honor. That being said we built Whoville with the Grinch Cindylouwho and Max was quite fun. Also, building the Taj Mahal for a client are the two that come to mind. I love knowing we, as owners, have a great privilege in being a part of the wellbeing our employee’s families and to have a great place to work. The business of doing business. Because we want to just focus on what’s most important to us – our clients. What changes have you noticed from when you first started out to now? First – the brides and their grooms are now both involved, throughout the decorating idea stage. 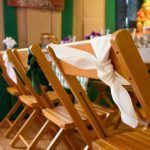 With both partners involved, they have a broader sense of what their dream wedding (event ) can be. Secondly – our ability to make their dreams come true. We have grown tremendously in our ability to use better tools, materials and the partners we have gleaned from. What trends do you forecast for the remainder of 2016? 2016 continues to be a rustic feel, some elegant and some with a down home feel. Globe lighting with crystal chandeliers, rustic barn tables, lots of greenery with elegant brass candle stands as decorative center pieces. Every person has their own flavor with regards to what rustic is. We love them all.